Go local or Go Online. We all know that technology is changing not only the way that we communicate, but also the way we organise. Whether it be organise our documents, our thoughts, our calendars or our life events. It is great when you can do everything without leaving your couch, but even better when this is contrasted against its old skool cousin – going local. In an attempt to be less wasteful, lower impact, and generally more efficient in life while also being more connected to both my global community as well as my local one – my new approach to life is either go local or go online. So far it is working out well. Instead of getting in the car to drive and buy something – I either try to source it within walking distance or buy it online. In the new model where sustainability and efficiency take priority those businesses in the middle of the spectrum fall through the gap. If they are not tied into my local community or they are not at my fingertips online then I don’t need them. I tested this theory organising our wedding a couple of months ago. Not only was it organised in a really short time frame but as far bringing together 130 people for a party, it was relatively low impact. Lots of people have asked me for detail on where all the elements came from so I thought I would share that example here. Read on if you want the wedding detail – otherwise let me know if you agree with only going local or online? Just married in an efficient and low impact way. In December last year my Mr Right and I got married. Growing up in a house with three brothers I was never a girl to dream about a big white wedding. I did want to have all the elements of the happily married life, the family, the house, the mess and the laughter. But I did not necessarily see the wedding as a critical element in reaching that. But after 7 years together, a pending move to Mexico City, 2 years travelling, 2 years house renovating and 2 years living with my parents… we both decided that bringing our family and friends together to witness the happiness and love that we share as a couple was something that we wanted. So after making this decision, 8 weeks later, we got married. During this time I was also travelling a lot for work so I guess that cut the time down by a few weeks also. It is funny how such a short turn around seemed incomprehensible to many people. 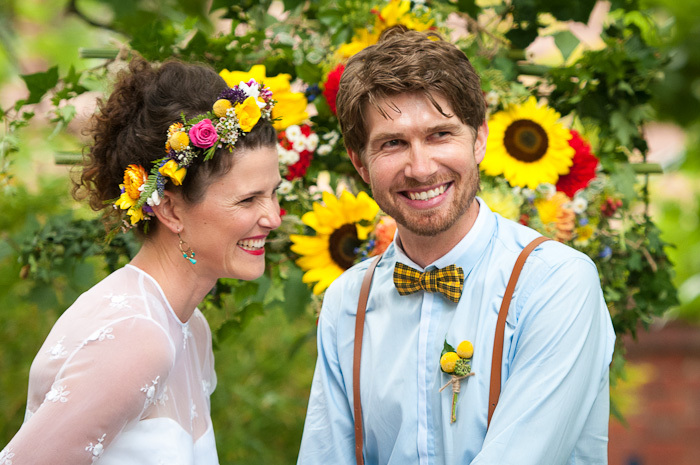 Lots of people have asked me how can you organise a wedding in a few weeks? I say, either go online or go local. Melbourne Designer, Rebecca Pocock, from e.g.etal . We got married in the gardens of the See Yup Temple. A beautiful Buddhist temple right near our house. So I walked out the backdoor. We gave a donation to the temple for allowing us to be married in this spiritual space. Having talented family members my brothers both shared their musical prowess on the ukelele and the didgeridoo. I was lucky enough that my mum not only had a great fashion sense in the 70’s when she designed her dress, but also that I put it on and it fitted like it was made for me. My mums wedding dress, bamboo arch from the garden and locally sourced flowers. My parents made an arch out of bamboo from the garden. Jess from Ivy & Eve did all the flowers. She is located across the road from the Temple gardens. Amazing. A very talented friend Nat Silber, read a poem she wrote for us as the solo reading at our ceremony. We were lucky to already know Matt Finch and he added an amazing personal touch to a ceremony that was really ours. Bicycles. It was 1km from the ceremony to the reception. So what better way to travel than by bicycle! 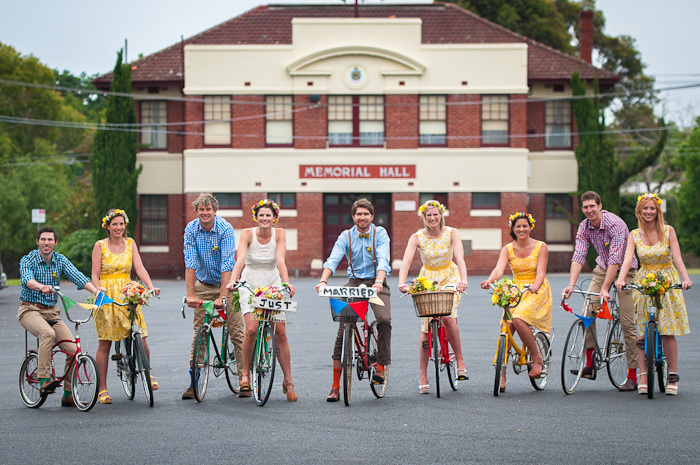 Best way to travel is by bike… even on the wedding day. The reception was at the community hall at the South Melbourne Commons. Great location, hall hire fee goes to the community. Amazing Latino inspired catering by Let Me Be Frank cafe which is also part of the South Melbourne Commons. We had a cake table with around 20 cakes made by amazing aunties, mums and friends. Lots of choice made with lots of love. All our decorations were made by our awesome family members from recycled jars (mainly gathered from the parents at the school where my Mr works), resused wood and locally bought material. We were lucky again to have talent in the family and our lovely cousin Tori from Tori & Sal captured the day for us. 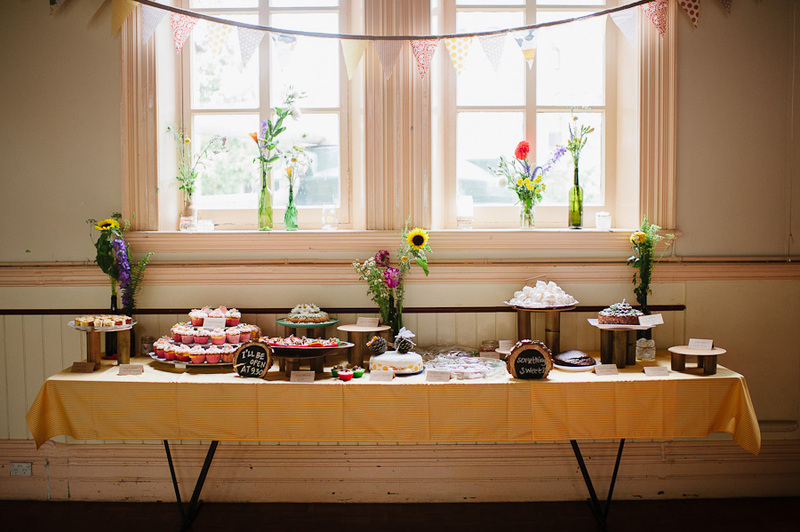 The cake table, bunting and jars all made with love. Having been tainted by the bridesmaid title we went with term special ladies. The ladies got dresses by Sohomode who is based in New York. 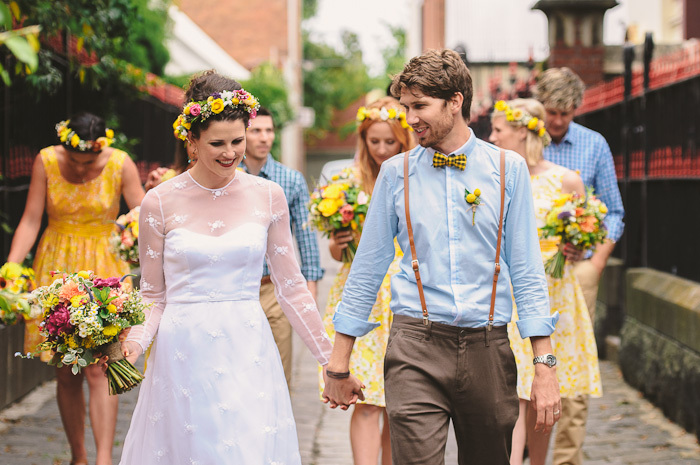 They chose their material and style and sent through their measurements and voila, two weeks later the dresses arrived. A second hand 1950s vintage ring with a story from GloryBeVintageWares on Etsy. An eco sterling silver wedding ring from Ephierell Jewellery. As you can see from this list. We did not give any service to the guy in the middle. Without him, we were efficient, low impact and supporting our local community. We only went local or online. What is your approach? 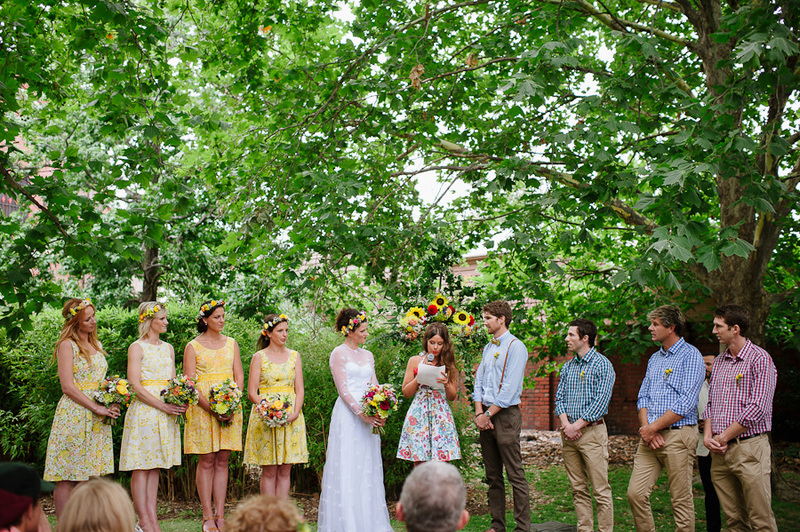 Wedding ceremony in the See Yup gardens.